For someone who came to cooking late in life, necessity being the mother of invention and all that, one of my favourite pasttimes as a child was looking through cookbooks and ogling at all the mouthwatering pictures. Desserts would normally take centerstage in this pursuit of virtual gluttony, but really, any well-plated, yummy looking dish would be salivated over repeatedly. One of these was this glossy rendition of a gazpacho. I can still picture it, a pale, tangy tomato broth artfully poured into a large earthenware bowl, with smaller bowls around it holding colourful garnishes of herbs, vegetables, and croutons. That was enough to hold my 10 year old restless mind at attention. But the cherry on the top, if you’ll pardon the cliched pun, was the discovery that this soup was served cold. Cold soup? Whoever heard of such a thing? Soups were hot, hearty broths that chased away colds and made you feel all warm and fuzzy inside. It would be many years before I would discover the joys of a vichyssoise on a hot summer day. The fact that gazpacho was a cold soup was a “Most Interesting Thing”, the kind that I would hoard and pull out with a flourish with a “Did you know?” prefacing it. 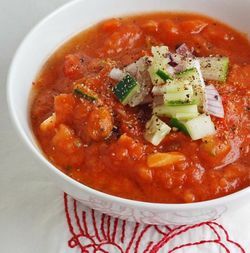 Gazpacho, as we know it, can be called either a liquid salad, or a soup, made from ripe tomatoes, bell peppers, cucumbers, garlic and bread that has been blended with ice water, olive oil, and vinegar. It is believed that it first arrived in Spain with the Romans. Roman soldiers on the march carried dried bread, olive oil, vinegar and salt and made their own versions of this basic dish of sustenance. The dish became a mainstay on the Iberian Peninsula, especially in the south of Spain, in Andalusia. However, there are some who believe that gazpacho dates back to even further, citing what may have been a prototype in the Bible. In the Book of Ruth, Boaz tells Ruth, “Come thou hither, and eat of the bread and dip thy morsel in vinegar”. The combination of stale bread and vinegar, the two mainstays of the original recipe are clearly referenced. In the 8th century, the Moors arrived in Andalusia, and through the mixing of the two cultures, this basic food source took on the form of the original ajo blanco, literally the “white garlic”. This included the addition of almonds and garlic. The principal centres for this early gazpacho were Seville and Cordoba. The most common versions involved a pound of bread soaked in water added to a sauce of anchovy bones, garlic, vinegar, sugar, salt and olive oil, letting it soften. Sometimes fruits and vegetables were added to make it a more festive dish called capon de galera, which, interestingly, is thought to be the predecessor of the Sicilian caponata. Historians believe that Christopher Columbus probably took casks of the liquid sustenance with him on his voyages from Spain, and when he brought back tomatoes, bell peppers and cucumbers, the soup in its present state was born. The recipe slowly spread through the rest of Spain, and then throughout Europe, especially through the auspices of Eugenia de Montijo, the wife of the French Emperor Napoleon III, in the 19th century. 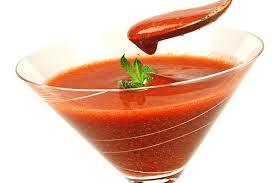 There are also a number of theories that speculate how the name “gazpacho” itself came about. Some experts believe that the word comes from a Greek word for a collection box in church into which people would put different coins and even bread pieces. Others say that the word has Mosarab or “would be Arab” connotations, as the Mosarabs were Hispano-Romans who were allowed to practise their religion on the condition that they owed allegiance to the Arab Caliph. By their account the word “gazpacho” was made up of three parts – “gaz”, which came from “qas”, which means to cut, “pa”, and “cho”, short for “chorba”, which means soup. Some experts say the word comes from the Latin “caspa”, meaning fragments, and still others maintain that the word comes from the Hebrew “gazaz”, meaning to break into little pieces. A simple way to classify gazpacho is on the basis of colour. Red gazpacho is the most familiar, and contains tomatoes. 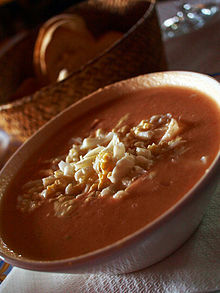 The most concentrated form is the Cordoba salmorejo, a thick, creamy soup without water, serve with hard boiled eggs and strips of ham. Sometimes, it may be garnished with chopped almonds, cumin, crushed mint or orange segments. 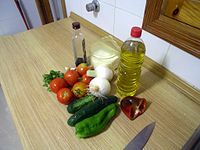 The Sevillian gazpacho is more liquid, and with bell peppers and cucumber, garnished with green peppers, hard boiled eggs, croutons, onion, tomatoes and cucumber, all finely chopped. White gazpacho contains no tomatoes but includes dried fruits. 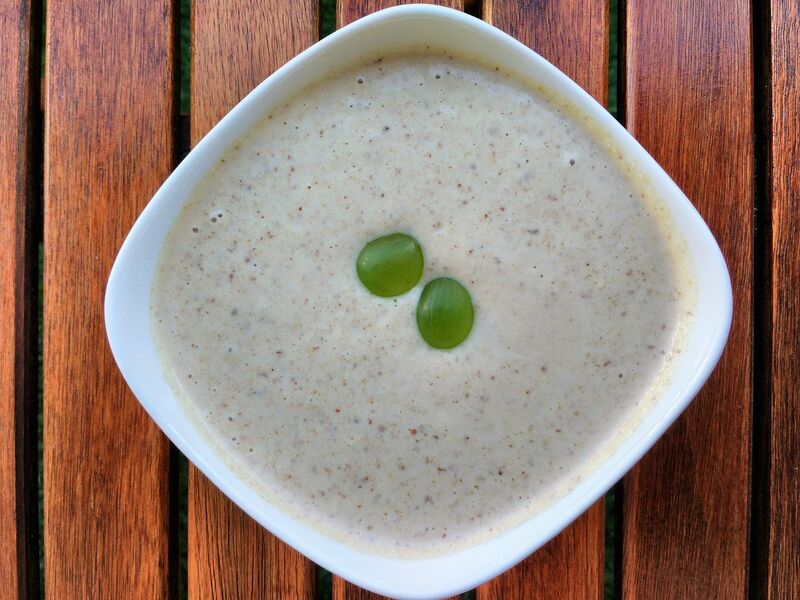 Today’s ajo blanco from Malaga, for example, is a blend of almonds, garlic, grapes and bread. Pine seeds can also be used. The strong flavour of garlic is sweetened with cubes of melon and apple. 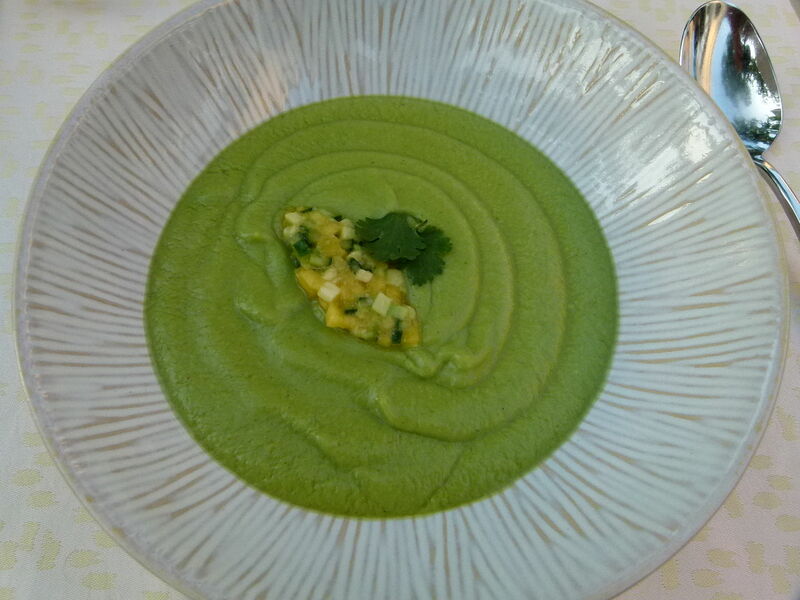 Green gazpachos are also without tomatoes but with spices that make them green in colour. The green gazpacho from the Huelva region and the Sierra Morena contains herbs like coriander, mint, parsley and basil, either on their own or combined, along with lettuce, green pepper and endive. 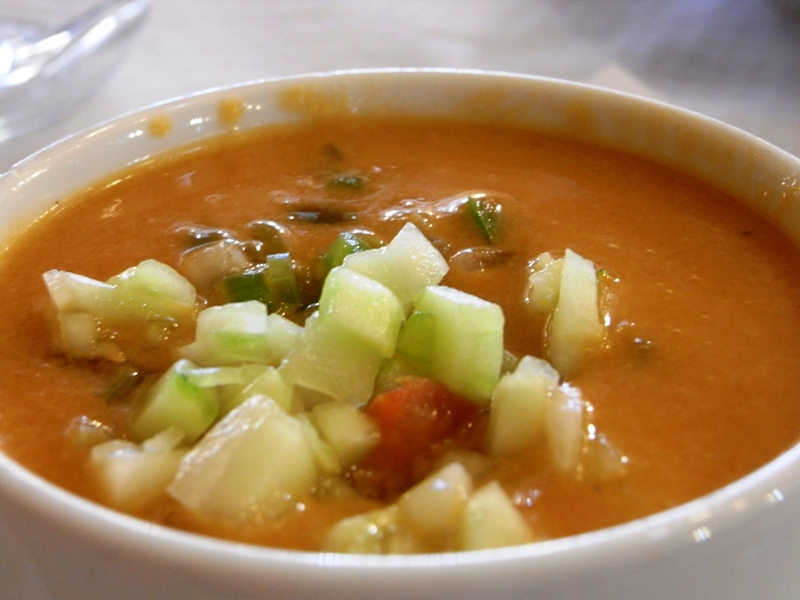 Gazpacho can be served as a starter, a main dish or a tapa. Like any good classic, there are numerous variations and evolutions of the dish. In modern variations, the tomatoes and bread can be omitted in favour of avocados, watermelon, meat stock, seafood,and other ingredients. Within Spain itself, there are numerous variations. In Extremadura, ham is added to the soup itself rather than being served as a garnish in a variation called the gazpacho extremeño. They also have another version called the cojondongo, or cojondongo del gañán, made of breadcrumbs, garlic, oil, vinegar and garnished with chopped onions, tomato and peppers. A version from Valencia is made with rabbit, partridge and quail. Another from Alicante is made with mushrooms and escargot. Gazpacho manchego, despite its name, is a meat stew served hot, not a variation on the cold vegetable soup. The arranque roteño from the town of Rota in Cadiz province uses less water, making it more like a creamy dip. 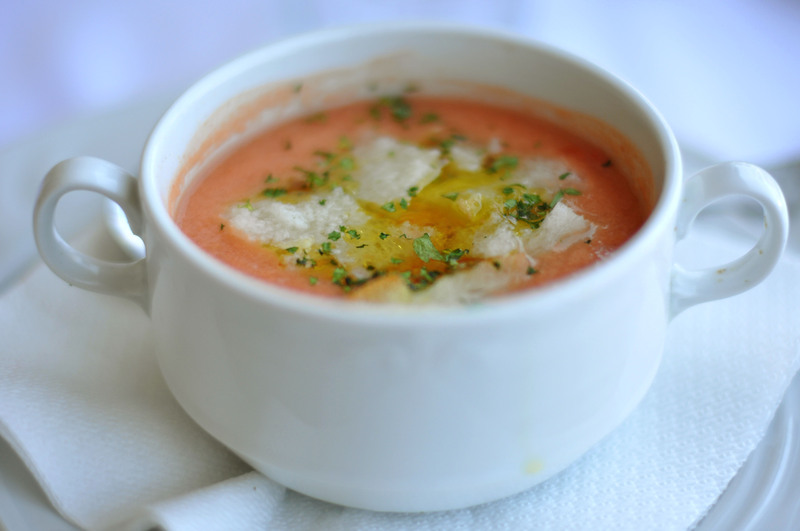 The gazpacho from the province of Avila has large pieces of vegetables floating in a watery soup, while gazpacho de antequera is made with homemade mayonnaise blended with lemon juice, egg whites, almonds and garlic. Spain’s neighbour Portugal also has its versions like the arjamolho. In modern restaurants, chefs are experimenting with different ingredients as well. There are tropical gazpachos using green mangoes and papayas, green tomato versions served with cornbread croutons and garlic aioli, avocado versions flavoured with cumin and cucumber, and basil and Tabasco sauce are used to add flavour and spice. A modern favourite is the seafood gazpacho with prawns, lobsters and clams. 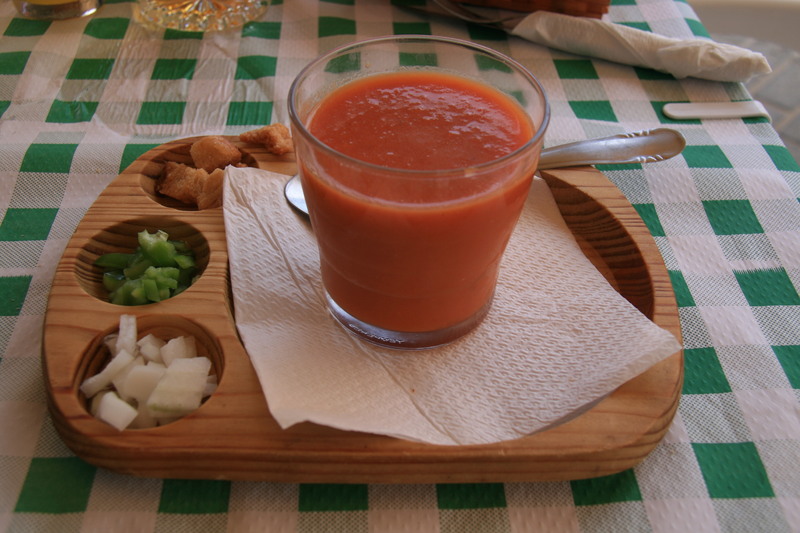 Traditionally, gazpacho was made by pounding garlic cloves in a mortar or a large wooden bowl called a dornillo, adding a little soaked, week old stale bread, olive oil and salt to make a paste, tasting all the time to make sure you have the flavours right. This laborious method helps to keep the gazpacho cool and avoid the foam and totally smooth consistency achieved by blenders. Very ripe tomatoes are sieved and added, along with vinegar, and the mixture is left to cool in an unglazed earthenware pot, called a bucaro. Gazpacho is served cold, or chilled but never icy. In village homes it is often served as a mains, along with fried fish, and leftovers are used as salad dressing or pasta sauce. On the second day of our trip to Spain, I sat in a little bodega in one of the picturesque squares in Seville and ordered a gazpacho, eager to taste the original Andalusian version. As the bowl of chilled freshness arrived on the table, surrounding by the little helpings of finely chopped garnishes, I was reminded of the old Spanish saying – “De gazpacho no hay empacho”, which means – “You can never get too much of gazpacho”. As I lifted the first flavour-filled spoonful and slurped appreciatively, I could only nod in agreement.